I’m always amazed by people who have artistic talent – musicians, painters, potters, etc. I have zero aptitude for that – I’m too left brained. Sometimes I can crank out some artistic code that makes me go – “Wow!”, but as for aesthetic visual or aural things, even my stick figures are lame. This Christmas season, I got a few bee related things that were hand crafted by some talented people. My friend, Lucia, is an amazing artist. I’m always in awe of the things she can create – from the paintings on her beehives to the digital and oil pictures she makes. Recently, she was inspired by my Buddha and the Bees theme and created the following picture for me. I keep a print of this on my meditation table and soak up the energy and artistry as I gaze upon it. Some of the folks at the Eldorado and Shoshoni Shambhava Yoga Centers are incredible potters. I remember learning to make pots once at summer camp or maybe in shop class, but I’m sure most of my work was lopsided. 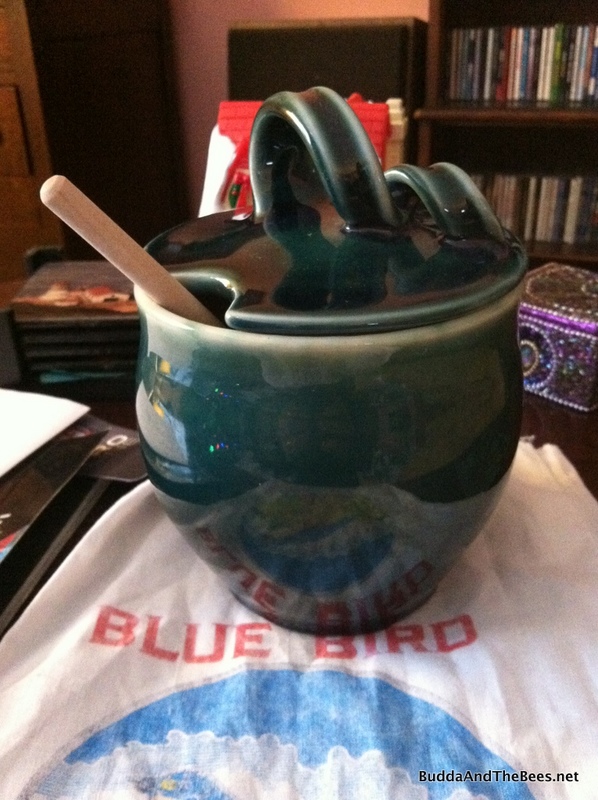 Diana got me a honey pot for Christmas this year which was made by one of her teachers at Eldorado. I can’t figure out how one would make a lid like this, let alone the pot! The handle is amazing. The world needs artisans of all kinds. It’s sad to see that music programs and shop classes are first on the chopping block at schools due to budget cuts. We need to foster the right brained people as much as the left. Unlike my relatives and friends on the East Coast, we woke up to a beautiful sunrise with a temperature of 13°F and some old snow on the ground – with the promise of more snow later to make this a truly white Christmas. The bees have been clustered tightly in their hive, with the occasional break to clear out their dead sisters. 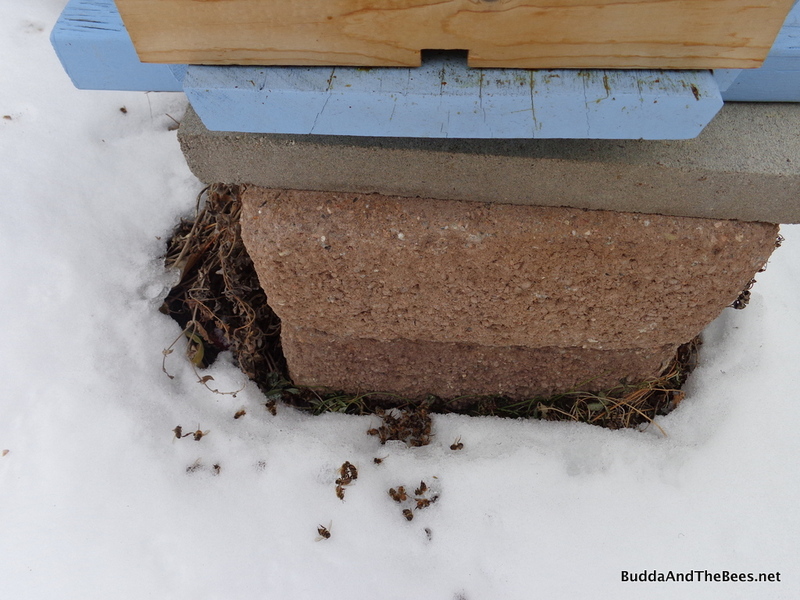 I cleaned out about 10 bees that were blocking the entrance yesterday – in hind sight, maybe I should have left them as insulation to keep the cold are from getting in through the entrance. There are far fewer dead bees than in past years, which makes me hopeful that most of them are surviving the cold. Now that the solstice is past, the hive will start gearing up for the eventual Spring when they can work their artistry of making hexagonal cells and delicious honey to fill my new ‘Hunny’ pot. Wishing you a Merry Christmas, Happy Pancha Ganapati and a joy filled New Year from Buddha and the Bees! Nice post. 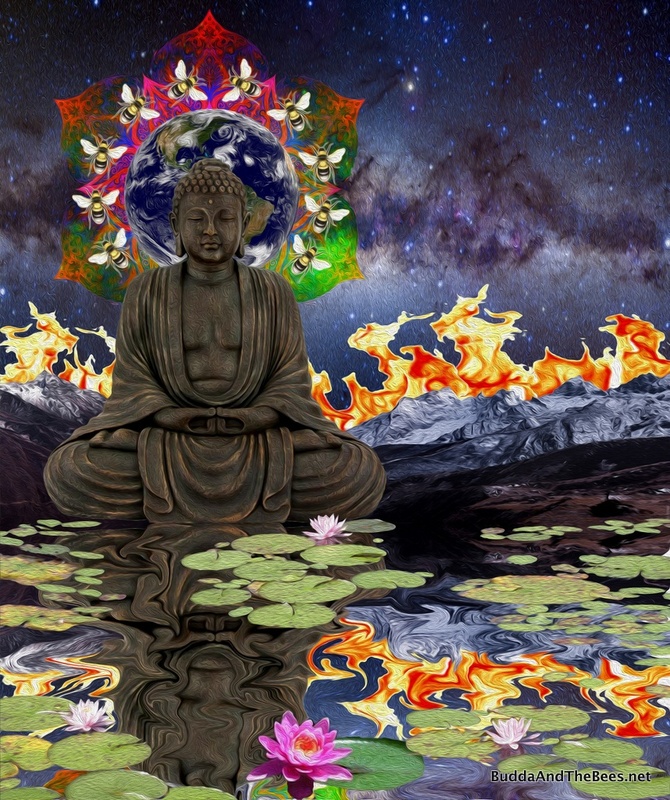 The picture of the buddha is beautiful. Peace. What gorgeous artwork and pottery gifts! They must like you an awful lot! 🙂 That honey pot is particularly wonderful. A number of years ago, I took a wheel class, but all my stuff turned out lopsided — better suited to being paperweights and doorstops than pots. So glad to hear that the bees are doing well and hanging in there! Best wishes for them and for you for the new year!